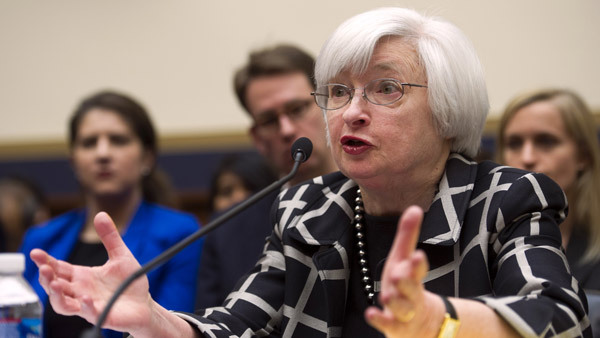 The March meeting of the FOMC will be critical to its communications with the public on interest rates. If, as market-watchers expect, the Federal Reserve raises interest rates in June, then expect to hear advance word of this at a critical meeting of the central bank’s Federal Open Market Committee in March. Sandra Pianalto, a former president and CEO of the Federal Reserve Bank of Cleveland, made this prediction at Tuesday’s opening general session of the IMCA 2015 New York Consultants Conference, held at the Sheraton New York hotel in midtown Manhattan. The Fed’s benchmark used to determining monetary policy, the federal funds rate, has been near zero since 2008, an experience the FOMC has not faced before. Also, inflation remains low, so there is little pressure to raise interest rates. A third factor is the Fed’s large balance sheet — $4.5 trillion-plus — an unprecedented sum owing to the Fed’s adoption since the 2007-2009 financial crisis of “unconventional tools” to help guide the economy. Pianalto said the Fed has tested some of the tools, but not in the quantities needed to control the Federal Funds rate. Communicating its intentions effectively to the public while not upsetting markets, she added, will also be a hurdle. Facing all of these challenges head-on is the Federal Open Market Committee, which determines monetary by influencing the availability and cost of money and credit. The FOMC has 19 members: 7 board of governors and 12 Federal Reserve Bank presidents. The FOMC’s policymaking, said Pianalto, holds 8 scheduled meetings annually, during which the committee reviews economic and financial conditions, forecasts the economic outlook, and then votes on an appropriate monetary policy. Whatever the FOMC’s decision on rates, Pianalto said, it must adhere to its “dual mandate:” statutory goals established by Congress for achieving maximum employment and stable prices. The FOMC pegs the optimal inflation rate for these twin objectives at 2 percent. While noting the maximum employment benchmark is determined by nonmonetary factors —technology, population, labor force demographics, regulation, fiscal policy and others — the Fed believes the cap to be “consistent with an unemployment rate” of between 5.2 and 5.5 percent. The economy is fast-approaching this target range. The Fed’s current projections have the unemployment rate dropping from 5.8 percent in 2014 to 5.2 or 5.3 percent before year-end 2015. By 2017, the rate could dip to as a low as 4.9 percent. The unemployment dip will be helped along by steady gains in gross domestic product. Current economic projections, said Pianalto, show GDP growing by 2.3 percent or more through 2017, the biggest increases happening in 2015 (2.6 to 3.0 percent) and 2016 (2.5 to 3.0 percent). If the Fed has anything to say about it, these numbers will be realized with the aid of non-traditional policymaking tools the central banks has adopted since the 2007-2009 financial crisis. The most prominent of these are asset purchase programs, popularly known as quantitative easing, that call for the Fed to buy government treasuries or other securities from the market to lower interest rates and increase the money supply. Since the recession, such asset purchases have ballooned the Fed’s balance sheet to $4.5 trillion from $900 billion. When the Federal Open Market Committee decides that a long-awaited increase in interest rates is merited, the decision will be guided by the Fed’s “target” rate for federal funds: the interest rate at which depository institutions actively trade balances held at the Federal Reserve. Pianalto noted differences of opinion within the committee as to the appropriate target rate for year-end 2015: This ranges from “no change” to 1.875. Most of the FOMC members favor a rate of 06.25 percent or greater. Differences among the FOMC members also are evident in their target federal funds rates for 2016 (0.325 to 4 percent), 2017 (2.0 to 4.25 percent) and later years (3.25 percent to 4.25 percent). Pianalto said that 15 participants believe that a rise in the federal funds rate target will be appropriate sometime in 2015. An additional two members are holding out for 2016. Pianalto noted also the difficulty in controlling the Federal Funds rate absent the use of non-conventional tools like quantitative easing, which encompasses it purchase of mortgage-backed securities and treasuries. “The FOMC says it will be diligent about gradually unwinding the large portfolio it has of mortgage-backed securities and treasury securities,” she said. “Right now, it is reinvesting the principal of those securities when they come due. Ultimately, said Pianalto, the FOMC’s decision on interest rates will be determined by “market data and not dates” — and by a determination to not repeat the mistakes of the past. Among them: wrong-headed central bank decisions that prolonged both the Great Depression and a stagnating Japanese economy; and, more recently, market excesses of the 2007-2009 financial crisis.